A payroll deduction form is a type of form where a certain percentage of salary amounts get deducted on various allowances like medical, traveling, provident fund etc. The form is used by the employers for the employees in the respect of deducting certain cost in the term of service. 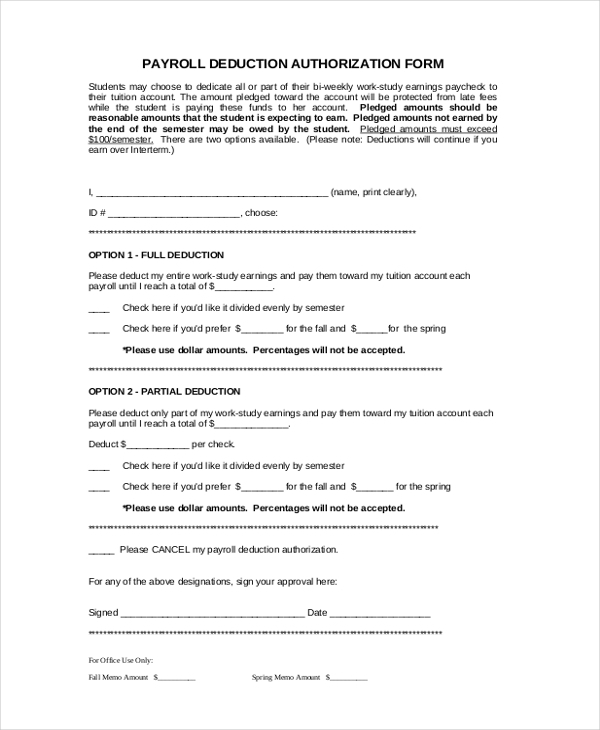 Every organization uses this form in order to deduct the cost of allowances. There are various types of other benefits which an employee enjoys over his or her service apart from the salary. All the other reimbursement cost gets highlighted in this form. 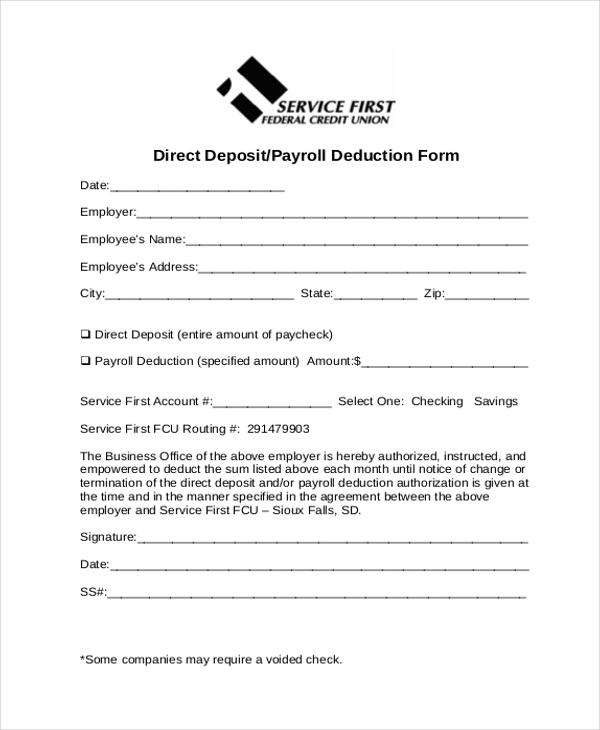 You may also use Payroll Direct Deposit Forms. 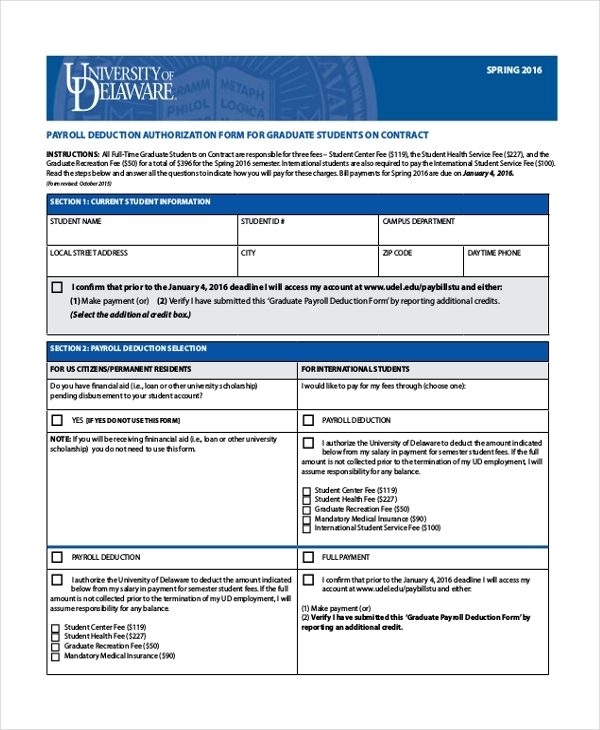 This type of payroll form is only for a graduate student of University Delaware. 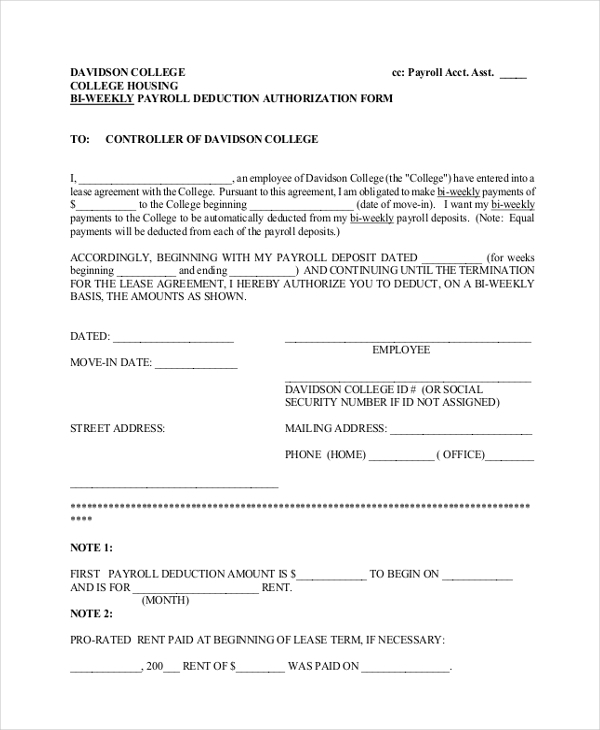 In this form, one need to enlist following details, Student’s name, permanent address, campus details, like student’s id and department, details about payroll deduction, and details about full payment. Payroll deduction Agreement is the agreement between the employee and the employer. 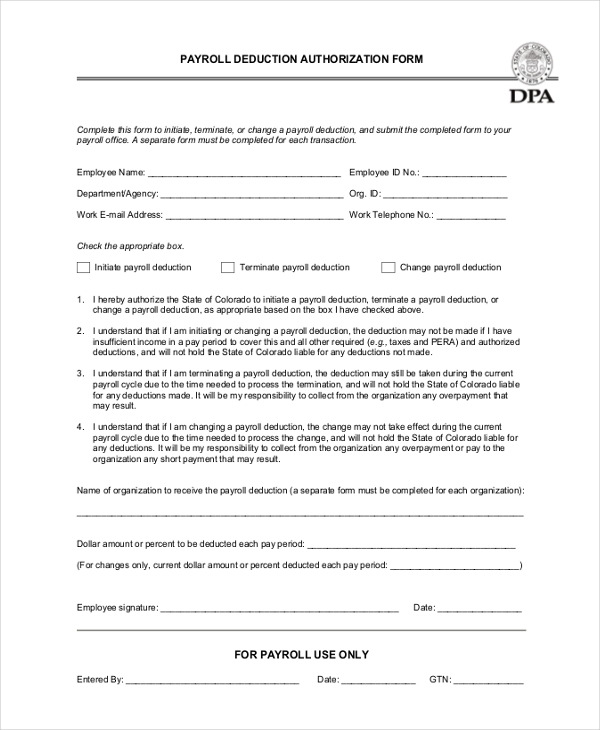 This form is being agreed to withhold amounts from the taxpayer wages or salary to apply for taxes owned.This form highlights that the employer agrees to participate in this payroll deduction agreement and will withhold the amount shown below from each wage or salary payment due to this employee. I will send the money to the Internal Revenue Service every week/two weeks/month or others. Some other details in this form are Terms of agreement, tax period, and kind of taxes. This form enlists details about employee’s payroll. This form is only being used in University of Wisconsin-Eau Claire Foundation. 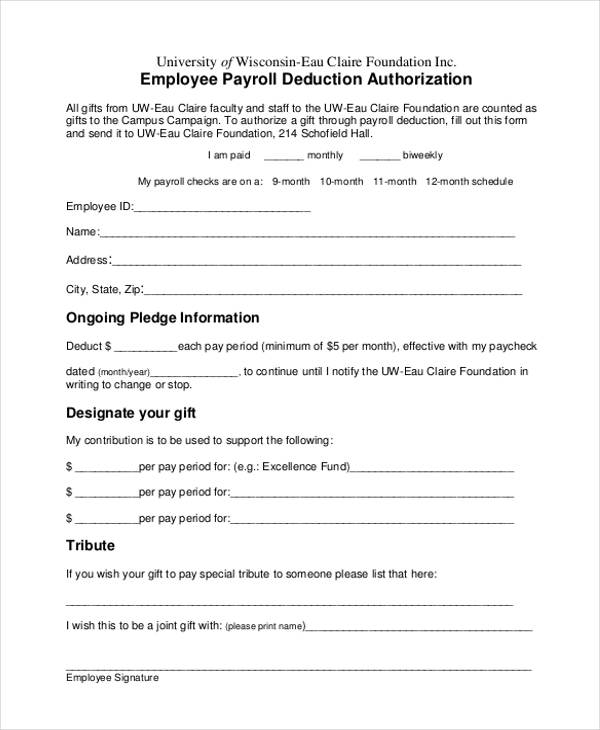 Details include employees’ id, Ongoing Pledge Information, Designate employee’s gift, Tribute, if the employee wants to pay tribute to any particular person. 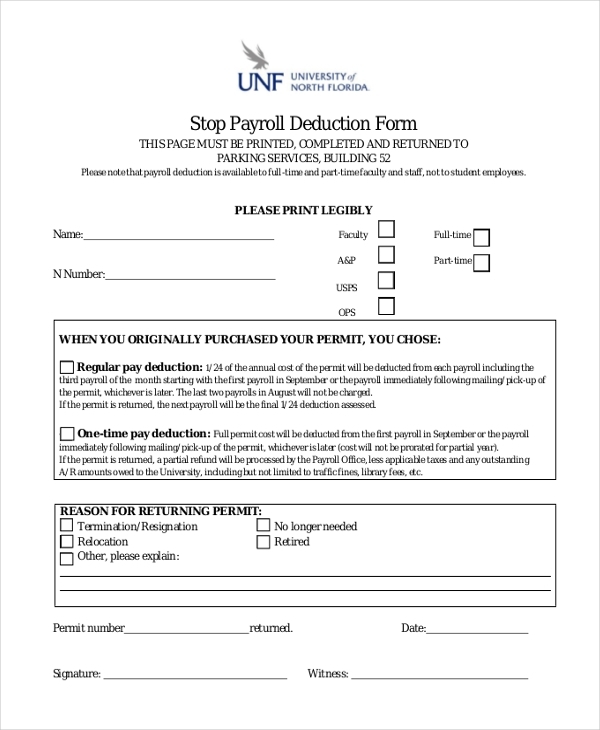 This function of completing this form is to initiate, terminate, or change a payroll deduction, and submit the completed form to the payroll office. A separate form must be completed for each transaction. The details include Employee’s name, employee id and other details about the employee and his payroll. This form is all about bi-weekly deduction of payroll. 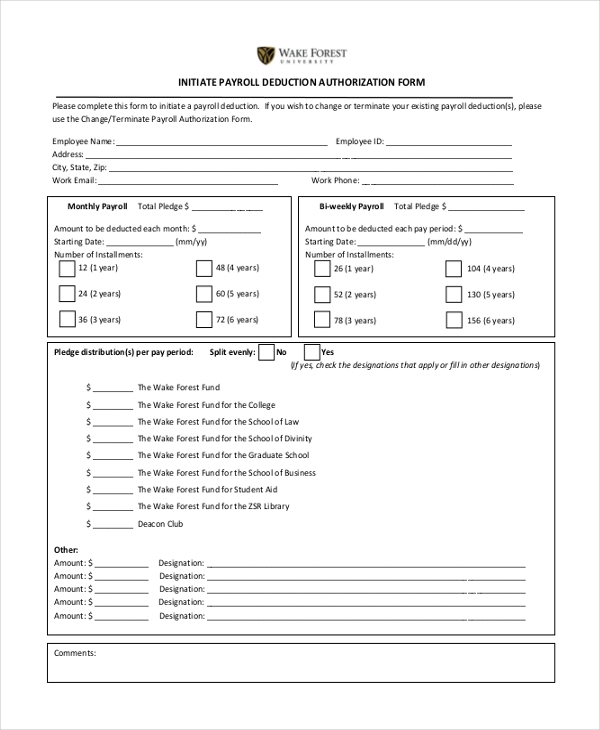 And this form includes details about contribution to be made. The form is mainly used in the voluntary payroll. 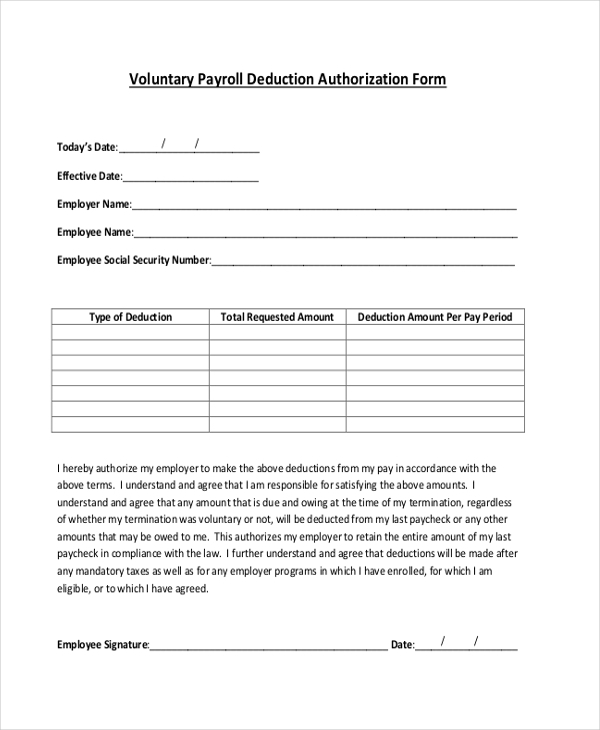 A person under a voluntary service in an organization uses this form for the purpose of payroll deduction. Considering the entire payroll, a certain amount of money gets deducted on various allowances like medical, traveling etc. This form is used for that purpose mostly in every organization. This is mainly used by faculties of college and Universities. 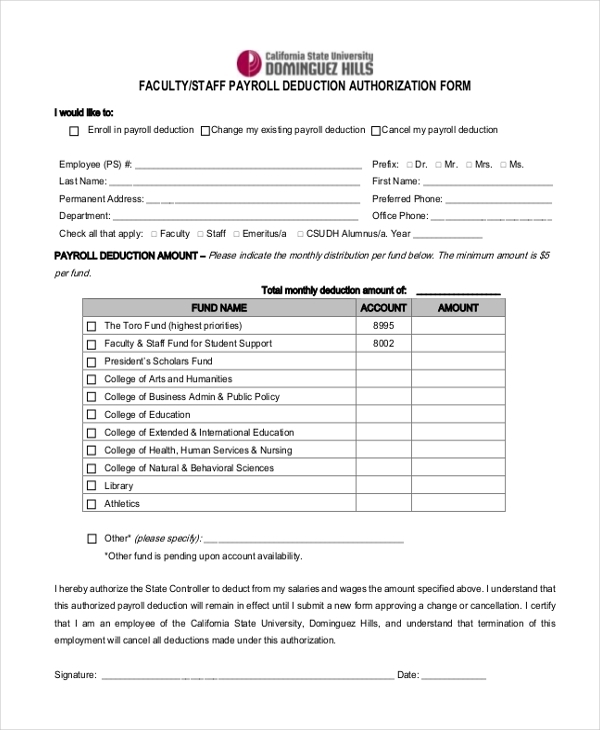 The form is a legal document used by the universities for payroll deduction. Every faculty gets a reduction in their exact gross amount salary. There are various allowances that get offered. The form is mainly used to highlight all the details of deduction that takes place over the salary. Students may choose to dedicate all or part of their bi-weekly work-study earnings paycheck to their tuition account. The amount pledged toward the account will be protected from late fees while the student is paying these funds to his/her account. This form is mainly used to initiate payroll deduction in various organizations. On the total salary, there is a certain amount of deduction which is based on various allowances. The form is mainly used for payroll deduction in various organizations. Every employee gets a certain amount of deduction on their monthly payroll. The form is used to fill in the details of the deduction amount. The form is mainly used to put a stop on various payroll deductions. In some situation, if an employee wants to stop the deduction on payroll amount, then the form can be used as an official document for stopping the money deduction. There is an automatic process of deducting the amount from the total payroll amount. This form is used to initiate the process of automatic cancellation. 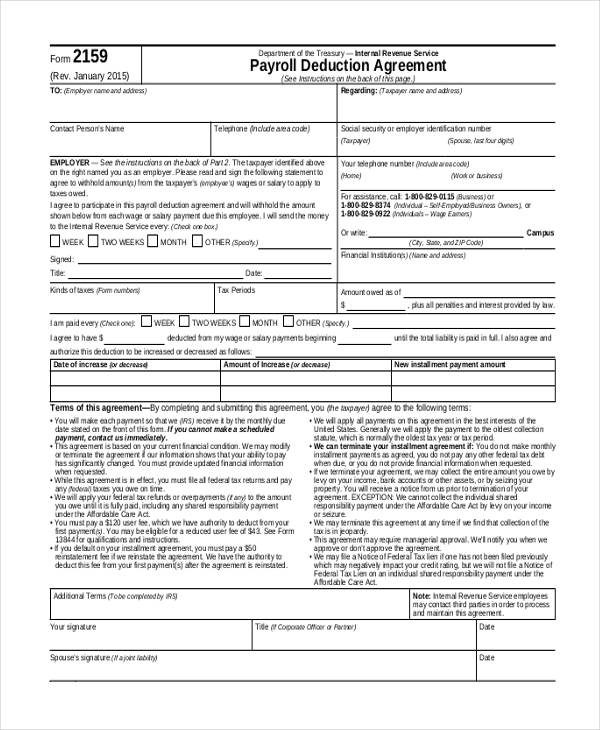 What is a payroll Deduction Form? A payroll deduction form is a type of form which is used by various organizations for payroll deductions. In the payroll process, a certain amount gets deducted due to the different allowances which the employee gets like medical, travel etc. The form is a legal document in every type of payroll deduction. Useful Certified Payroll Forms. It works as an official proof for the deduction process. The entire payroll documentation details are clearly highlighted in this form. The form has a varied acceptance in all the industries. The target audience of this particular form is all those people who are under the payroll scheme in an organization. All the people liable to get payroll amount can use this form for various allowance deduction. This form is mainly used to deduct an amount from the payroll salary for different allowances. 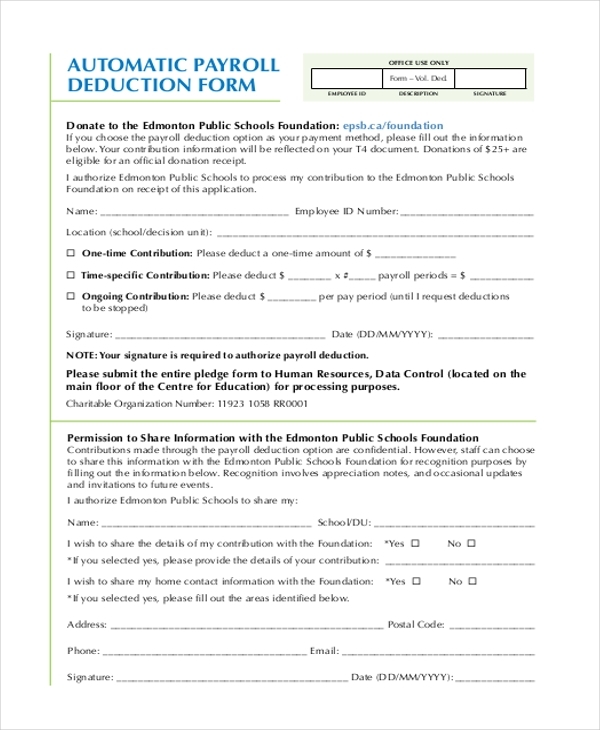 A payroll deduction form is right now available in both word and PDF format on our website. All these forms serve various purposes and are absolutely available in customized sizes for every user. Any individual who needs this particular form can simply download it from the website and can edit it according to requirements. The template of this form is quite popular among many people. Right now, the market has a huge demand for this type of form and people are highly satisfied with our samples. You can also see Payroll Remittance Forms. The payroll deduction form is the only important and a legal document which is produced in association with the payroll deduction.